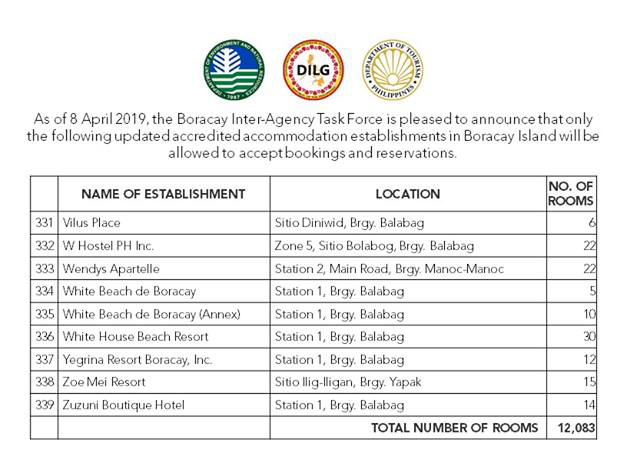 Please note that by order of the Intergovernmental Task Force that is managing the rehabilitation of Boracay, only APPROVED AND COMPLIANT hotels will be able to accept guests. Please be advised that tourists will be issued special tourist ID at the Caticlan Jetty Port to ensure compliance. Please check the following list which will be updated regularity as information is provided by the intergovernmental task force. Pwede lang po ba if I book both flight and hotel sa Cebu Pacific or Traveloka? Regarding to your concern, Yes, you can book both flight and hotel in Traveloka however, apologies to inform you that we’re not sure about Cebu Pacific if they book the same. We highly suggest that you contact your company that you want to travel with your family so that your company will contact directly to your travel agency regarding your concern. After that, the OTA will give you new voucher. In that case, there will be no problem with your family when they enter the island. I hope this information helps. If you have any clarifications, please let us know. Hi, would like to ask as we happen to have confirmed booking at Astoria for 4pax. Our room though, is good for 6, (4adults and 2kids) and instead, we will be arriving as 5 adults as a family. We can’t afford to pay an extra bed as the hotel would advice since our availed timeshare with them is already good for 6 and that the room we booked is already too spacious for the 5 of us to pay for another bed. Won’t we have problems entering the island? Thank you and God bless. There will be no problem in entering the island as long as it stated in the voucher the total number of traveler and the lead guest name is travelling with you. If you have any clarifications, please don’t hesitate to ask. Hi! We’re planning to book for an accommodation that doesn’t have a pool, is there some resorts in Bora that we can pay to swim in their pool? We are pleased to inform you that we can assist you with this. Kindly visit our website MyBoracayGuide.com and enter your travel dates, total number of travelers including the child. You may choose your preferred hotel in hotel options and book directly online. I hope this information help, feel free to let us know if you have clarifications. 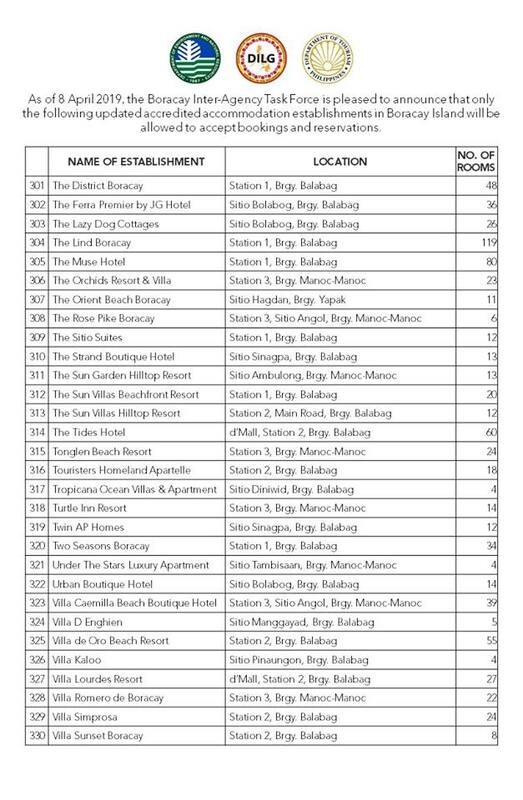 Hi..with regards sa hotel booking policy upon entry in boracay na requirement, for group bookings needed po ba my list ng lahat ng names or pwede yung name lng ng person na ng.pabook ang mag.appear sa hotel voucher..thanks! We are pleased to inform you that you only need to register the total number of traveler including the child if have. Also the lead guest name should be traveling with you. Hi! We’ll arrive in Kalibo at 7:00 pm of July 22, 2019. May I please know if we can still make it Caticlan port? What are the port schedules? Please be informed that the Caticlan port is operating 24hours. We highly suggest to contact Jetty Port Caticlan for more relevant information, you may reach them thru this number 288-7613/288-7419. I hope this information helps. If there’s anything else we can assist you with, please don’t hesitate to contact us. If I need to book extra persons for our current accommodation, can this be done at the resort/hotel? Yes you may book your accommodation with the resort directly. However, please be reminded that the exact number of persons arriving in your group should be indicated in your resort voucher for confirmed entry in the Island. On the other hand, you can always visit our website MyBoracayGuide.com and make a direct reservation online. I hope this information is helpful. Let us know if you have questions. Is Scandi villas accredited ?? Upon checking, we are unable to locate Scandi Villas in the DOT list of accredited resorts. 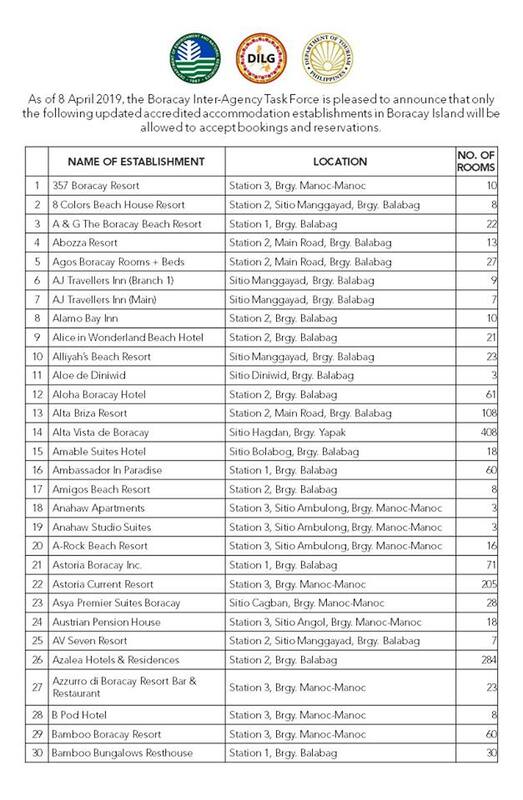 How about Boracay Moreno’s Lodging in Station 3? Please know that Moreno’s Lodging is one of the DOT accredited resorts. Hi, my friends and I are going to Boracay in June 2019. However, rumors from the local there said that Boracay will be closed for the phase 2 rehabilitation process. I just wanted to make sure if this is true. We are glad to hear that you and your friends have chosen Boracay for your holiday destination! With regard to your inquiry, please know that there is no official announcement from the Government regarding any phase 2 of the rehabilitation. I hope this information helps! Let us know if you have questions. Hi, is it enough to present the hotel voucher of an accredited hotel to get to Boracay or do I still have to present something else? That would be fine as long as you have a confirmed hotel booking on one of the accredited hotels in Boracay. Hi, is Lazy Dog Bed & Breakfast accredited? I am not sure because they are not on the list and I have already made some reservations. Thank you for contacting us. The lazy dog is already on the lists. Please check the link of the accredited hotels below. The name is The Lazy Dog Cottages. We already have a confirmed hotel reservation. However, the voucher indicates that only 2 guests will be staying in the room, but we are a group of 5 pax. Will the head count be strictly checked at the Caticlan Jetty Port? Thank you! Thank you for contacting us. We would highly suggest contacting your hotel to revised the hotel confirmation voucher to ensure smooth arrival for your group. Do we need to book first so that we will be allowed to enter Boracay? Thank you for contacting us. Yes, you have to book your hotel first to one of the accredited hotels on the island. This will serve as your passport to enter the island. sa hotel voucher po ba kilangan nka indicate kng ilan kayu sa bookings? Yes, the number of persons should be indicated in your hotel voucher. The hotel voucher is proof that you have a confirmed hotel booking in one of the accredited hotels on the island. Please have it printed to avoid delay at the jetty port. If I booked online through agoda.com can I show my hotel booking as a voucher? Yes, you can. Please have the voucher printed to avoid delay at the jetty port. What do we need for a “voucher” to prove our staying on boracay? Just a print out of the hotel booking? Thank you for contacting us. Once you have a confirmed hotel booking, your hotel will send you a confirmation voucher. This will serve as your passport to enter Boracay. Please have it printed. Hello. Is Levantin Boracay accredited? They told me they were accredited already after the above list was released. 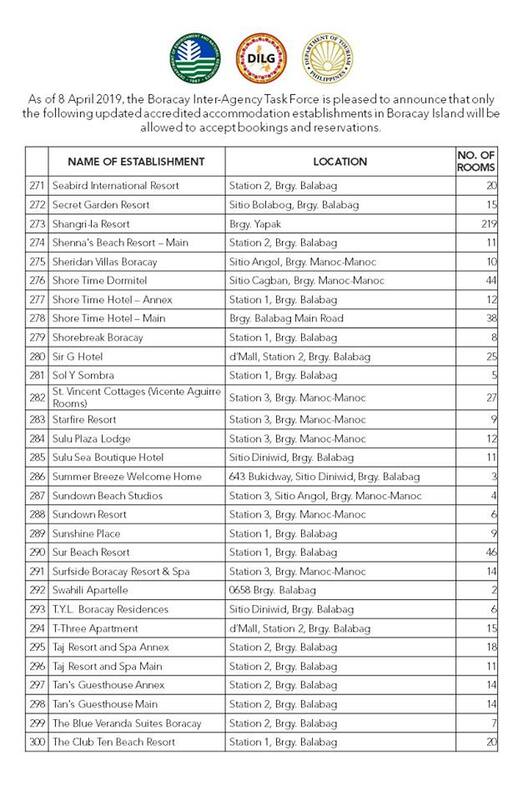 But I have not yet seen the updated list of accredited hotels. 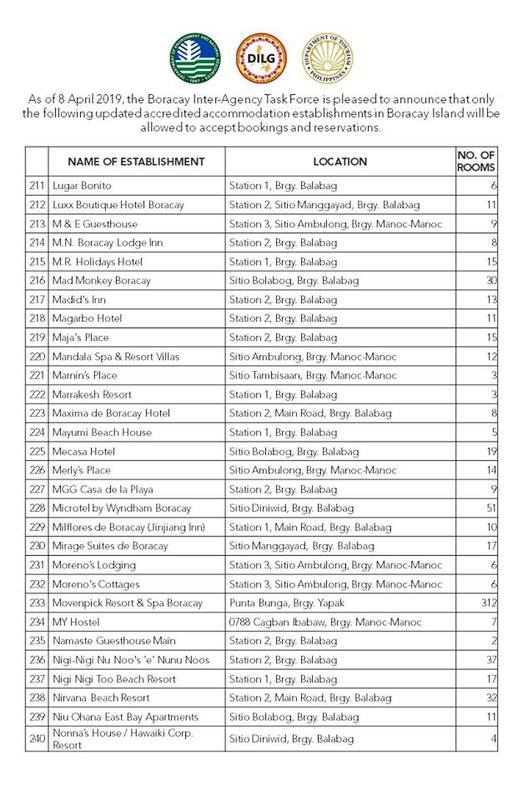 Please check this link for the lists of accredited hotels published by the Department of Tourism of the Philippines as of March 20. 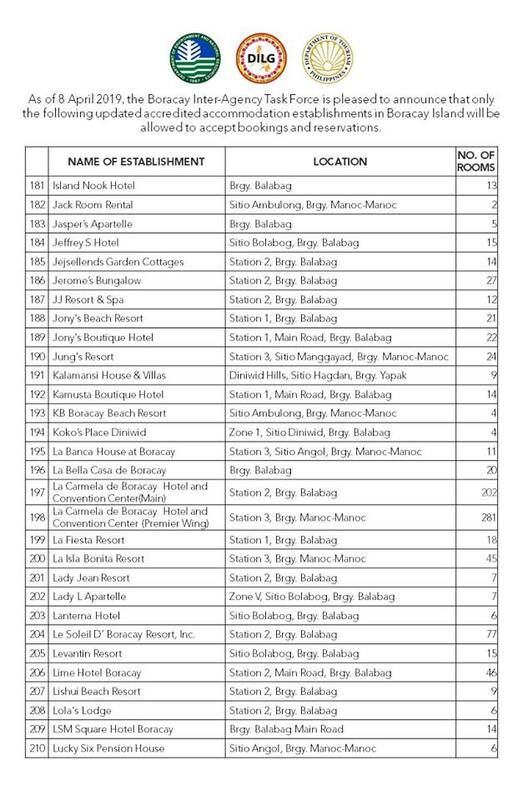 Please check the link below for the lists of accredited hotels published by the DOT as of March 20. 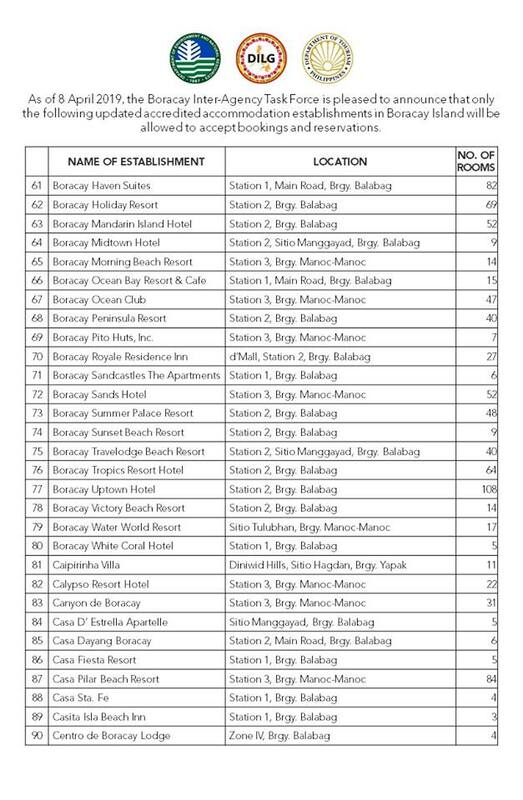 Could you tell me please, is Tanawin Resort going to be opened or demolished ? Thank you. Thank you for contacting us. Definitely, Tanawin will not open, however it will depend on the government if it will be demolished. Hi, I arranged hotel booking via Travel Agency in Dubai. The Hotel name is Sitio by the beach & the sitio villas & suites. Is it the same as The Sitio Suite? Thank you for contacting us. Sitio by the beach and Sitio Villas and Suites are under same owner however different location. They are both located in station 1, however, sitio by the beach is located in beachfront area while the villas and suites is like 5 minutes walk to the beach. I was told Nigi Nigi Too had been demolished but it’s on the list. Can you confirm this is correct? Nigi-Nigi Too is already operational and they just demolish some of the areas in their hotel due to Government mandate. However, rest assured that they are now open. Hi. We have already booked an accommodation at La Carmela however, we only booked for 4pax. We found out later that we an additional person will be joining us and we will be 5. Are we allowed to just pay for the extra person at the hotel? Do the personnel in the pre-registration area in Caticlan Jetty Port allow the 5 people when in fact the accommodation is only for 4pax? Hope to hear your respons. Thank you. We would highly suggest requesting for the revised voucher with the correct number of persons from your hotel to avoid delay at the jetty port. 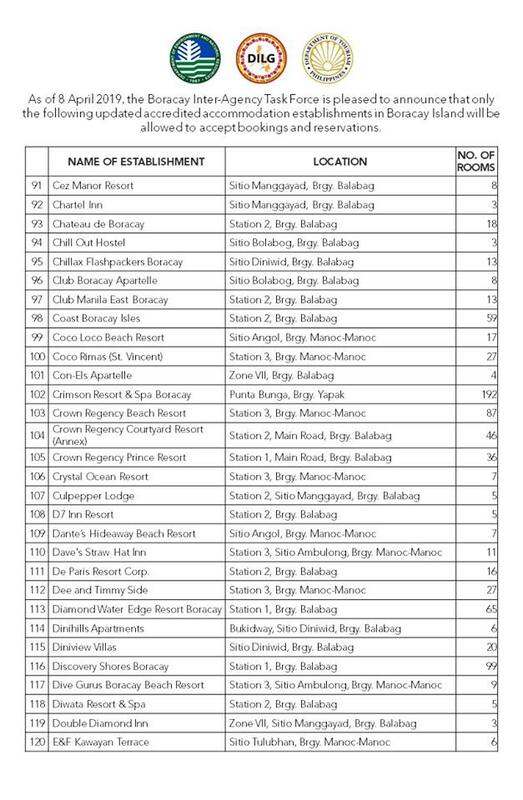 Monaco Suites de Boracay Hotel was in the list before. So I had booking the hotel. but in the last update, it is gone ? is that mean I have to booking another hotel ??? We would suggest contacting Monaco Suites directly and check the status of your confirmed hotel booking with them. Your booking may be considered as confirmed, as you made the reservation when the hotel is still on the lists. Thank you for contacting us! Yes, Boracay is open on your travel dates. For your hotel inquiry, please check our website (www.myboracayguide.com). We offer lists of hotels that you may consider. We also offer hassle-free transportation from the airport to your hotel and vice versa and of course your Boracay escapade won’t be complete without doing thrilling adventures. I had booked a hotel in Station 2 with 7 pax but originally we are 8 pax. Can the other one enter boracay without any hindrance? Hi, is it possible if we can stay at my Tito’s friend who is living at Boracay? If yes, what proof do we need to present at the Caticlan Jetty Port. Thank you! Invitation letter with the Boracay Id of your Uncle will be the primary requirements that the jetty port will require, However for more details and clarification, we would highly suggest calling the Malay Municipal office for more detailed lists of requirements. Thank you for contacting us! Yes, that would be fine as they are free of charge. Collect photocopies of your relatives ID before arriving, most importantly Baranguy Identification, address, etc. This will usually suffice. Hi, villa simprosa is on the list. That means I can book with them and I will not have any problem with regarding the accreditation issue? Thanks! Should I worry? Is there a way how can I know if the airbnb property we are looking to is DOT registered? I already sent an inquiry to the host but I have to book first and pay before they can answer my questions. My predicament is what if they are not DOT registered and I already make a 50% downpayment? I have not seen single Airbnb properties listed. If it’s a larger hotel using Airbnb it’s very possible, likely even, that they are accredited. Without knowing the specific property in question we can’t really help verify. If you can find a phone number or email for the property, I’d start there. I have the same issue, as I am searching for a smaller, calm and more familiar property. Do I really have to book in at one of these hugh resorts and hotels (if would be a reason to chose another destination for me) or are there “private listings” offered via AIRbnb? and how can I be sure? Regarding to your concern, there are also small resorts and hotels here in Boracay that you can book with. In addition, there are no private listings offered via Airbnb. If you have any clarifications, please let us know. I also made a reservstion with lazy dog! They r not on the list from what i an see! So i guess i have to cancel it?? Hi! I’m looking for a place to stay that fits my budget at around 1500 below. I found one on airbnb but I’m not sure that it was allowed since it was not in the list of hotels posted by DOT. Hope you would answer my question. thank you! I’d contact the host directly through Air BNB. They will be able to better explain their approval situation, it may be fine at this stage. I’m not sure what your travel dates are so I can’t search the various OTA. You can input your dates here and sort price from lowest to highest. Best luck! 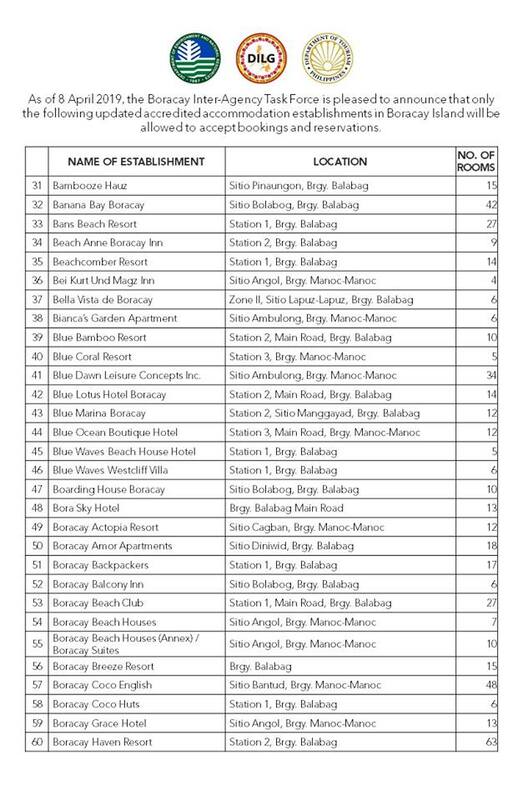 You can only enter the island without a hotel voucher if you are Residents of Boracay or if you have a valid id that address to Boracay Island or you are a worker of hotel/resort. You totally need a hotel voucher to present at Caticlan Jetty port. I checked government list and has less hotels listed .For example the hotel we booked is not listed on the official website but is listed here.How can I know the list is accurate? The list comes from the DOT official facebook page. The latest post of compliant hotels updated last February 9, 2019. You may check their facebook page here. 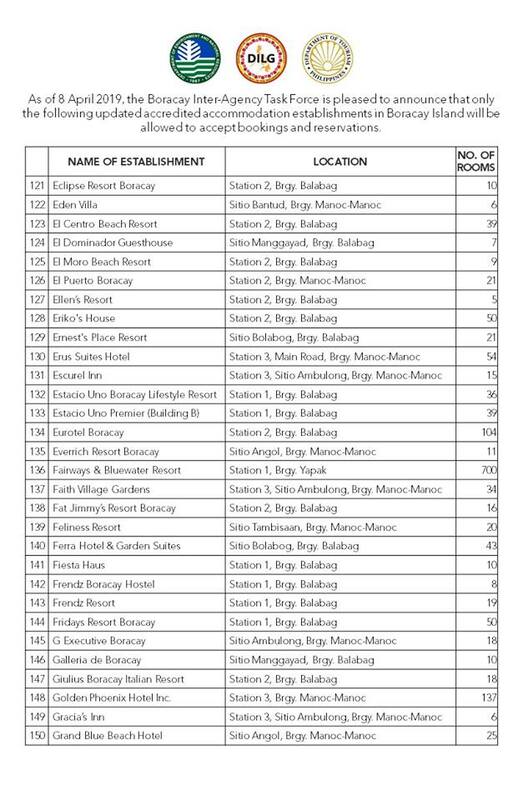 Why I am not able to find this list on the http://www.tourism.gov.ph/? How can I be sure the list provided is not the a fake one? where can i get pre arrival registration form? You need to book a hotel that DOT Accredited before you can enter the Island. 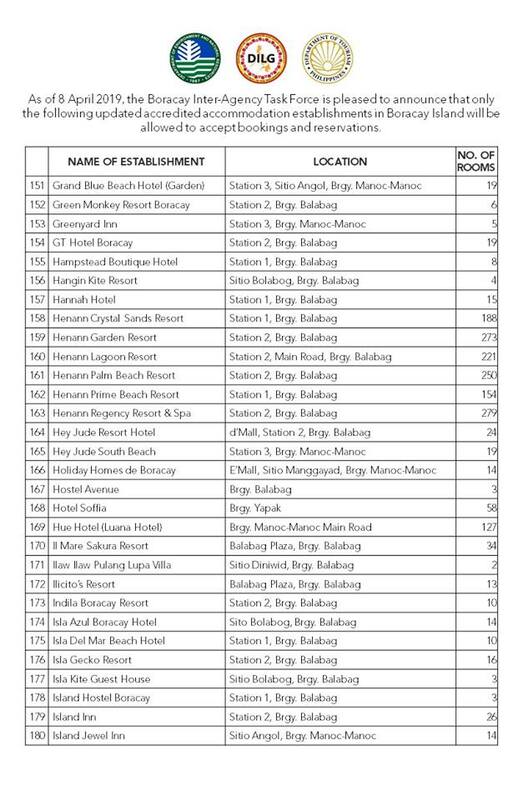 Here’s the updated list of Accredited hotels. And present your hotel voucher at Caticlan jetty. Is there a list of Airbnb accommodation that are accredited with DOT in Boracay. Many hotels list various room types via AirBNB. Many non accredited hotels are voluntarily removing themselves from listings such as AirBNB. Your best bet is to check this list against available properties on AirBNB. To the best of our knowledge, this is the best working list of accredited hotels available online. Have a great day! Please may I have the copy of the list. Glad you came up with this! i’d Like to see if Lazy Dog is on the list. This entry was posted on Monday, April 8th, 2019	at 1:00 pm	and is filed under Recent	. You can follow any responses to this entry through the RSS 2.0	feed. You can skip to the end and leave a response. Pinging is currently not allowed.